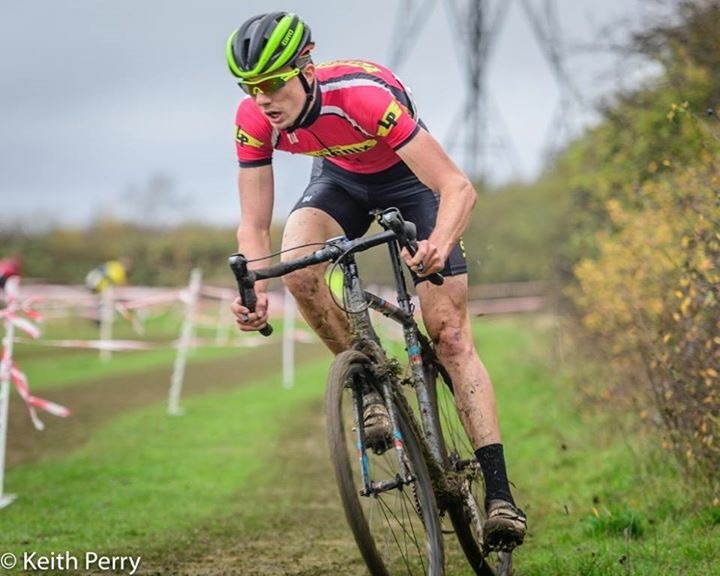 Will Beresford, Chris Clague and Damien Robertson contested the V40 and senior categories at Houghton Regis, which played host to round 7 of the Central CX League. Before the race Chris looked at my tyres and said ‘ah, you won’t need those!’ I hadn’t changed my limus from yesterday at Bury, where they were very apt. So, yep, I was very much ungridded, back row, but with the whistle pushed through every gap and passed on up. One rider tried to block me, I waited and galloped past. Rode up to 7th, 6th, 5th, 4th, passed them, and got 3rd in my sights. 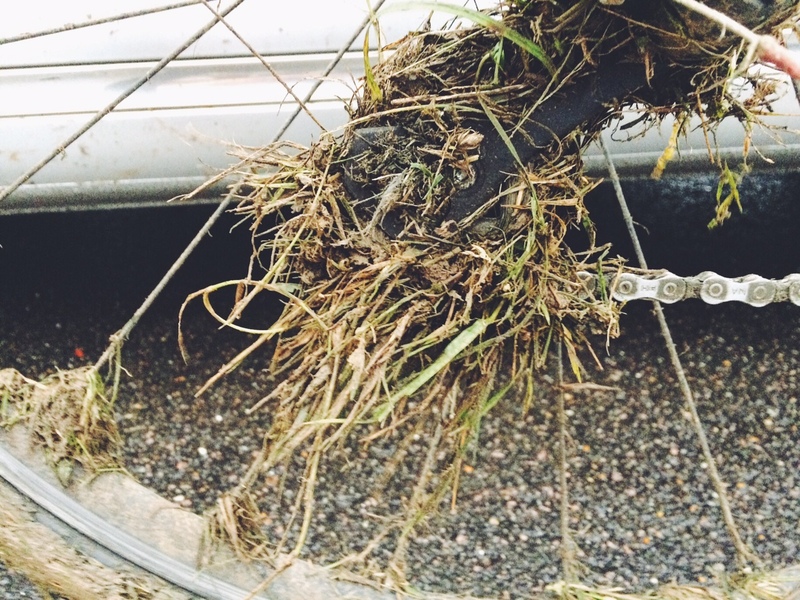 He, apparently Mike Jackson, was in no man’s land, as two race leaders had ridden away. It took me about a lap to bridge over. He saw me coming and dropped back and onto my wheel. There he stayed for a lap or so, before I dropped to let him round, cat and mouse. He seemed very unwilling to do any work, and rode slowly until I passed him again and beckoned him to work, asking him if he was a roadie. He was glued to my wheel. After another half lap he said, ah, his teammate had dropped back, meaning he was ready to make an effort. The final lap beckoned, he rode past me and skilfully hopped the smaller hurdles to ride away. I wasn’t catching him. Took 4th. My first gridded race, and front row next to Matt Jones (Winner) but despite this I actually didn’t get a very good start, and perhaps need to work on this, as I must have lost at least 10 places coming into the first bend, the crash next to me didn’t help, but still. 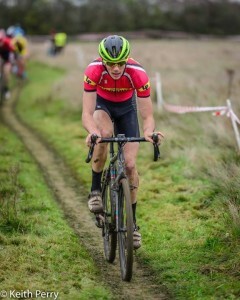 First lap in and I had managed to pass a few riders and was up into around 7th now. HR went from low 60s to about 180 in around 20 seconds, there is nothing quite like the first lap of a cross race. Bike seemed to be handling well, and the lowered pressure on the Clement MXPs was working well, certainly felt better than in practice… Onto the 2nd lap and I pushed into 4th where I pulled away from 5th to create quite a gap which kept on growing, bar any mechanical I knew I could hold 4th and it was now a matter of reeling in 2nd and 3rd (no chance was I getting 1st…) I could see 2nd & 3rd battling it out ahead, and over the course of the next 3 laps I managed to get across, it dam near killed me, but I did it. I sat on their wheels, thankful for the rest for around 1/3 of a lap, and then made to move to try and drop them, this worked (for a bit) and I was now upto 2nd, but after a quick look around it became clear that 3rd and 4th were not going anywhere, I made a few attacking moves, but unfortunately nothing managed to stick (apart from the mud) We all exchanged places over the next few laps with nobody looking like the clear favorite. With 2 laps to go I was 4th rider, but starting to feel a bit, well, knackered. Damien was shouting from the side to keep it smooth and stay with them, I was trying… I stayed with them until the bell lap where they opened up a 5 second gap, I tried to get across, they were slowly pulling away. I knew that even if I managed to get across, after my earlier 3 lap solo attack, i’d have nothing in the sprint. I therefore crossed the line 4th, some 8 seconds behind 3rd and 2nd who battled it out in the sprint. To be honest, I was really pleased, in what was another tough field (both people and circuit) I actually really enjoyed the circuit, there was enough twisty sections and fast and flowing bits to make it enjoyable. The bike preformed well, a 1×9 setup was perfect, meaning that the chainline, except the rear mech of course, was mud free (kind of anyway), that said the frame did get a bit clogged up with grass and mud and that no doubt slowed me down, but then I guess that was the same with every other rider.